The Nucleus II is a sleek, compact single-channel wireless follow focus system with a wireless range of up to 1,500 ft. It features a fast response, low-noise and high-torque motor that can be attached to 19mm or 15mm rods with the included rod adapter bushing. 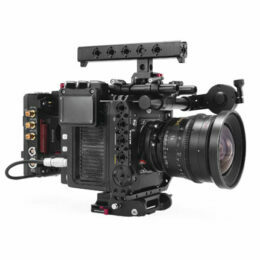 The motor has a 0.8 mod, 35 tooth, 32 pitch gear attached, which is the standard gear size for cinema lenses. The motor drive (MDR) is small and compact and can be attached to 19mm or 15mm rods with the included rod adapter bushing. The MDR includes a small LCD screen and navigation buttons to allow you to adjust the menu settings to your liking. The included P-tap power cable distributes power from your camera rig to the MDR and then a separate cable connects the MDR to the motor. The MDR can also connect to and interface with Preston and Heden motors if you prefer. The hand unit has a super compact design with an easily navigable menu system to allow you to adjust a multitude of settings as you see fit. It runs off of a single Canon LP-E6 rechargeable battery and includes an attachable lanyard to allow you to always keep it close to your body during hectic times on set.